Una Mamma Italiana: Homemade Mac and Cheese for the Birthday Girl - with Cake Pops! Homemade Mac and Cheese for the Birthday Girl - with Cake Pops! Each of my kids gets to pick their dinner of choice on their birthday. This started as a cute and innocent tradition and has since developed into the very cause of my migraines! If there was a parenting course on "How to Teach your Children To Be Demanding Needy Little Tyrants," then I would graduate with honors. As our kids have gotten older and smarter they now have very detailed stipulations on what exactly their birthday dinner will entail. For instance, my son usually asks for chicken soup. But not just any chicken soup - "the homemade kind, from whole roasted chicken bones, with mini meatballs and pieces of chicken....and the carrots need to be soft...and grated Romano cheese on top - heaping spoonfuls of grated Romano cheese," to be precise. And then I lovingly smack them with my wooden spoon....I mean........ I give them a kiss and say, "Anything for the Birthday Boy!" Well, this year my daughter was turning FIVE! Five is a HUGE deal to her since it means school is coming up this year. Also, I have learned a ton of new things about turning five. For instance, (straight from my daughter's mouth) "When you're five you don't take naps anymore." 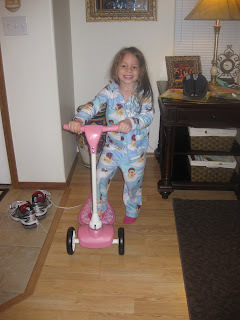 Or "I can ride my scooter in the house cuz I'm five." Everything she wants to do is now suddenly allowed at the age of five. In your dreams, kid. SO this year the Birthday girl requested homemade macaroni and cheese. VERY cheesy macaroni and cheese with absolutely "NO ham" (here come those stipulations again). And she wanted it to look orange like the box of store bought 'Macaroni and Hydrogenated Oil' (some call it "Macaroni and Cheese"). Well, that wasn't happening because I used a wonderful gourmet blend of cheeses that were predominantly white! Yeah, that did not go over well. But in the end she loved it (and so did we cuz we got our yummy cheese fix) You know how I love my cheese. So here is a recipe that I altered out of my trusty Betty Crocker cookbook. I switched up some ingredients and ratios and, of course, cheeses. But if you want to pick your own selection of cheese, just stick to the overall amount of cheese and pick cheeses that melt well. For instance, mozzarella would not be a good choice for this! Melt butter in a saucepan. Stir in the flour, mustard, Worcestershire sauce, salt & pepper. Cook over low heat, stirring constantly until mixture is smooth and lightly bubbly. Stir in milk. Heat to boiling, stirring CONSTANTLY! Boil & stir 1 minute. Turn heat off. Stir in the cheese until melted. Toss the pasta in the sauce and pout into an un-greased casserole dish. Bake uncovered for 10 - 20 minutes. Here, you have the option of topping it with more cheese or maybe crumbled Ritz crackers or bread crumbs - whatever you like! Buon Appetito! Yum! But I was wondering why "mozzarella would not be a good choice for this", just a flavor thing or a texture thing or something else? could you elaborate. YES!! It is a texture thing. When Mozarella melts, it gets very stringy. Creamier cheeses work best for this!! Ciao! The Mamma Meets the Cucina: COOKING WITH SPIRITS!